Would you like some extra credit for history for the 4th marking period? Who wouldn't! All you need to do is read a title from the list of approved books (fiction or nonfiction) and complete the correct graphic organizer to turn in to Mrs. DeSimone. 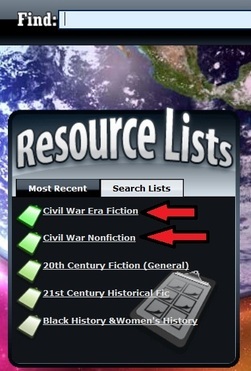 "Civil War Era Fiction" & "Civil War Nonfiction." Click on one of the lists to scroll through books available to you for this assignment. Remember, you don't have to "hold" a book that is marked "in." Simply come down and check it out! Please have one or two books in mind before you come to the media center. Mrs. Newman is not creating a special section for these books.